With a fresh paint job and all new merchandise, Goop’s pop-up gets a facelift for its final weeks in Dallas. Each year, Goop’s gift guide makes virtual waves for being, well, pretty Goop-y honestly. But say what you will about the infamous, over-the-top guide, co-signed by Gwyneth Paltrow, at least people are talking about it. Come December, practically every blogger, department store, and publication (including D) offers a gift guide. It doesn’t hurt to have a portable yurt, a $2,500 razor, or a camel milk subscription service to make your guide stand out. 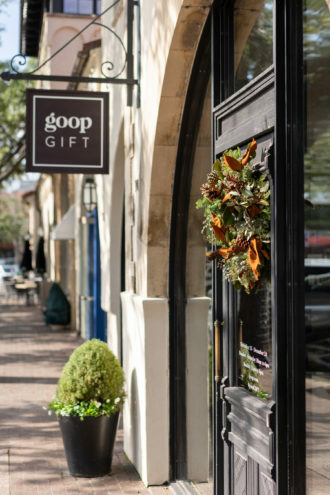 Yesterday, Goop’s gift guide launched online, and in three city pop-ups (located in San Francisco, Manhasset, New York, and thanks to our Highland Park Village pop-up, Dallas) that make it possible for locals to shop the discerning selection IRL. Goop Gift pop-ups don’t feature the entire Goop gift guide — sorry if you had your sights on a $7,700 Hermès surfboard — but each of the twelve online categories, spanning from The Host and the One-Step-Aheader to The Lover (in true Goop fashion, there are vibrators aplenty), is well represented. The Dallas shop will also score a few exclusive Goop collaborations. Kendra Scott is set to host an interactive jewelry bar for a week starting December 4, while collabs with Green Pan, Oso & Me, Jérémy Collot, and more are in store now. Goop launched their second Dallas pop-up back in April of this year, and stuck around well beyond their initial end date of June 3. The store was repainted black and completely refreshed for Goop Gift, which will run through December 24, when the brand packs up (presumably) for good.